Anyone else annoyed by these unholy deals orchestrated by Mayor Counts’ administration in Arnold, Missouri? On the November 3, 2015 ballot, the City of Arnold sought voter approval for a new half-cent sales tax in Arnold. That measure failed. By the way, my opponent in the April 2016 city council race (incumbent Brian McArthur) voted in favor of seeking voter approval for increasing sales tax rates on Arnold residents. But I digress. Leading up to the election, a slick advertising campaign supporting the city’s sales tax proposal was organized by the Mayor and members of his administrative team. That campaign, financed through a political action committee known as Building a Better Arnold, spent nearly $40,000 attempting to sway public opinion in favor of higher sales taxes. Who contributed to the $40,000 attempt to sway voters, and why? Anheuser-Busch contributed $15,000 just a few days after the Arnold City Council wiped out approximately $20M of future property taxes due over the next 20 years for the $150M Metal Container can plant expansion owned by Anheuser-Busch. Arnold forgives $20,000,000 of taxes due from Anheuser-Busch, and then Anheuser-Busch reciprocates by contributing $15,000 per the request of Mayor Counts to the campaign to increase city sales taxes. It is patently offensive that Anheuser-Busch seeks to escape property taxes for itself, but funds an advertising campaign attempting to convince Arnold voters to impose higher sales taxes upon themselves. All orchestrated by the Mayor with the cooperation of the City Council. Missouri American Water contributed $10,000 to the sales tax campaign. Earlier in the year, the City sold its profitable sewer system to Missouri American Water. 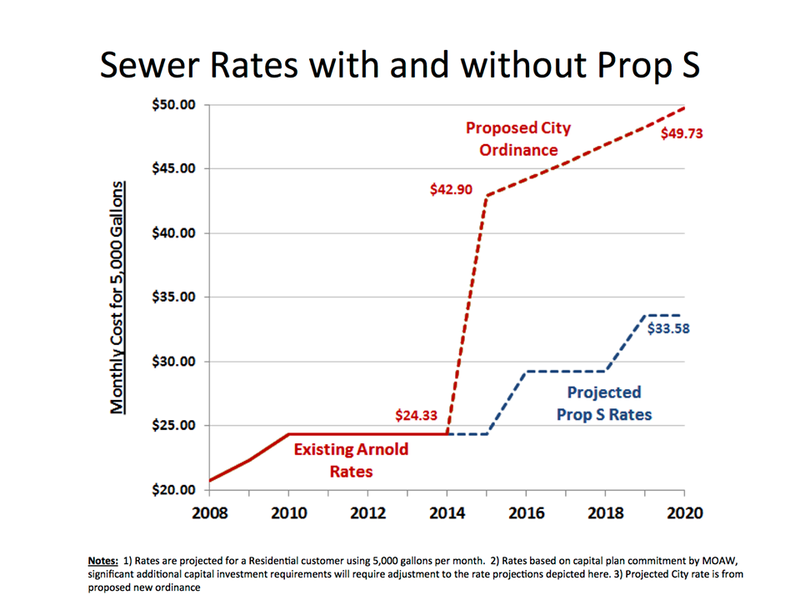 Since that sale, the cost of sewer service in Arnold has been on the rise. First a utility tax was added to sewer bills, thereby increasing our cost of sewer services. This increase to the cost of living in Arnold was not disclosed to voters before the Mayor and City Council sought voter approval to sell the sewer system. Now, Missouri American Water has filed a request with the Missouri Public Service Commission to increase sewer rates about 20% higher than current rates. It is patently offensive that Missouri American Water, after purchasing the profitable cash machine of a sewer system from the City, and knowing they would be seeking to raise sewer rates with no objections coming from the Mayor and City Council, would also fund ballot initiatives seeking to increase sales tax rates upon Arnold residents. This too orchestrated by the Mayor with the cooperation of the City Council. By the way, Missouri American Water purchases sewer pipes and related appurtenances and equipment needed for the sewer system from vendors outside the City of Arnold, thereby avoiding payment of Arnold sales taxes on its purchases. Yes, I’m annoyed by these city hall deals pinned on Arnold residents. Better decisions could have been made. Which is why I am running for a seat on the city council. I would like to add that an employee of the law firm of Arnold city attorney Bob Sweeney serves as deputy treasurer of Building a Better Arnold. As I posted yesterday, another city council candidate, Vern Sullivan, serves as treasurer. Finally, it is worth remembering that American Water poured $244,000 into the campaign to persuade voters to approve the sewer sale. The Mo PSC is holding a hearing for their rate case in Arnold on 2/5/2016. I encourage residents to go testify to their campaign contribution and how they promised us they wouldn’t raise rates.